No matter how much planning you do to open your business, there’s so much more you’re going to learn once it is up and running. One of the first things you’ll discover is that real-world experience is so much more valuable than what you might learn in the classroom. Earning a business degree, can certainly provide you with the foundation to get a business started but it can prepare you for all the little things that you have to take care of. Along with customer service, supply chain logistics and marketing you also have to make sure your business space is well-maintained. That’s where regular junk removal sessions are smart business move. This is a job for Junk King Birmingham. You are certainly going to work with a lot of independent contractors and vendors throughout the course of your business. Junk King Birmingham has helped business owners clear out all kinds of rubbish from their stores, restaurants and offices. What can they take away for you on a regular basis? Yes, there’s a lot that you can toss out into the dumpster that’s part of your trash removal service but there’s just as much that that service won’t pick up. Junk King Birmingham can haul away things like old manikins, display cases, stacks of cardboard and any other type of construction waste. A regular junk removal session can be set up on a monthly basis so that any excess rubbish can quickly be removed by the Junk King crew. This is a team that has plenty of experience when it comes to lifting and loading heavy objects. You and your staff will never be put at risk moving those kinds of things. This is also a company that is licensed and insured which makes them 100% professional and trustworthy. You can set up your regular appointment online or over the phone. If it works best for the crew from Junk King to show up before you open for business, then that’s exactly when they’ll come by. 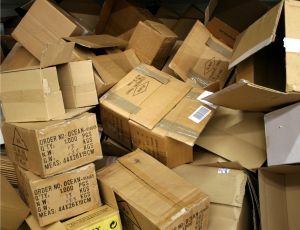 Even if you want to become during business hours they’ll be able to get in and get out with all that discarded junk without any disruption to your business. Regular junk removal sessions from Junk King Birmingham are always a smart business move. This entry was posted in Birmingham Junk Removal and tagged business, clutter, Junk King, junk removal on October 31, 2017 by Junk King. Last updated October 31, 2017 .